THE INITIATION OF SARAH (1978): Carrie Goes Camp Classic On Campus – Schlockmania! One of television’s foremost tools in its war against Hollywood during the ’70s was the t.v. movie. If something was popular at the box office, you could count on t.v. doing the cheaper, gentler knock-off version that you could enjoy for free in the privacy of your own home. Sure, t.v. movies couldn’t compete with Hollywood in terms of wild content or artistic freedom but they could deliver a mixture of pop sensibility, good casts and hard-to-define weirdness in their attempts to do general audience-friendly versions of big screen trends. 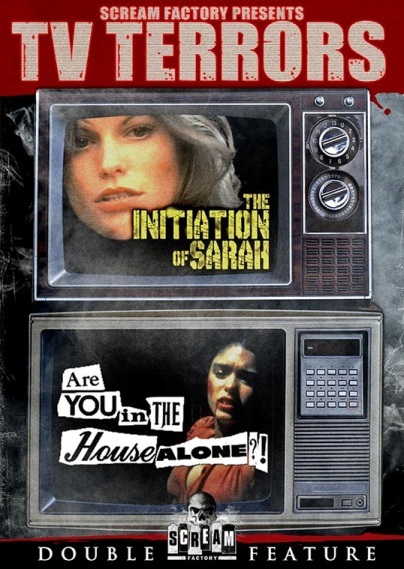 A fun example of a small-screen knockoff with its own eccentric personality is The Initiation Of Sarah. This 1978 tele-film is an unapologetic knock-off of Carrie, complete with a misfit who has destructive powers and a gang of mean girls who push her too far. However, the basic scenario is modified to include a few new wrinkles. In this redux, the misfit heroine is Sarah (Kay Lenz), a wallflower who was adopted as a child. As the tale begins, she goes off to college with her loving but more popular sister, Patty (Morgan Brittany). Both intend to pledge for the same sorority but Sarah quickly finds herself shunted out of the picture by Jennifer (Morgan Fairchild), the queen bee type who runs the sorority. Patty meekly protests but gets swept up in the social whirlwind, thus driving a wedge between the two sisters. Sarah ends up at a misfit sorority where the house mom is Mrs. Hunter (Shelley Winters), a weirdo with skeletons in her closet who senses Sarah’s special powers. She starts to find some new friends, most notably emotionally fragile musician Mouse (Tisa Farrow), but Jennifer can’t get enough of picking on Sarah and her fellow misfits. Combine this with Mrs. Hunter’s desire to harness the impressionable Sarah’s powers for vengeful purposes and the results are a soap-operatic melodrama with a telekinetic/supernatural kicker. The Initiation Of Sarah has some problems inherent to t.v. movies imitating their big screen rivals. It has a scenario that is overplotted and undercooked all at the same time: the story is riddled with plot threads that it introduces and then leaves dangling, most notably the mystery of Sarah’s parents, whether or not her powers are supernatural and the nature of Mrs. Hunter’s long-repressed crimes. It also has to pull a lot of punches in the horror department to follow network content standards (and also maintain a t.v. budget): the first two-thirds of the movie relies on fairly simple “shocks” like a piano falling from the ropes suspending it and someone almost getting hit by a car. T.V. vet Robert Day’s direction of the material is slick and brisk but a bit perfunctory, as if he had one eye on the shooting schedule. 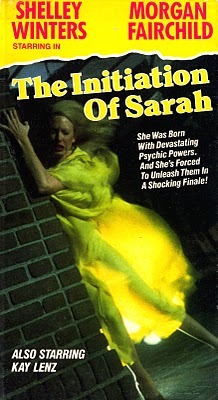 However, The Initiation Of Sarah has a distinctive personality that it makes it fun for schlock-loving horror buffs and t.v. movie addicts. When it’s not imitating the story structure of Carrie, The Initiation Of Sarah develops a style that is half camp classic and half strangely heartfelt message movie about misfits finding their way in the world. The camp stuff is held down nicely by the intrigue between the sororities and the catty portrayal of campus social Darwinism. These scenes have the dishiness of a good primetime soap, particularly with future primetime soap star Fairchild leading the way. The message element is held down by Sarah’s search for self in the misfit sorority , with the friendship between her and Mouse being unexpectedly touching. The highlight of the film in this vein is an impassioned speech that Sarah gives to Jennifer about how she’ll ultimately regret her casual cruelty to others – a moment as unexpectedly resonant as the pro-nerd speech Anthony Edwards gives at the end of Revenge Of The Nerds. It’s also worth noting that both the camp and message elements of the film register strongly because The Initiation Of Sarah excels in an area of t.v. strength: i.e. good casting, with a focus on up-and-coming talent. Lenz brings a poignance and emotional intensity to her troubled heroine role and gets quality backup from Farrow, who delivers he r best-ever work here as the new friend who is meek but determined to connect. On the campier side, Winters chews the scenery with the abandon fans expected from her at this stage of her career and Fairchild is bitchy, blonde perfection as Sarah’s main tormentor. The smaller roles are fleshed out with a lot of familiar faces like Robert Hays, Talia Balsam and Michael Talbott (who ironically played a similar role in Carrie). In short, the appeal of The Initiation Of Sarah might be lost on the more self-consciously serious members of the horror fanbase but those who can appreciate the campier side of the genre will find plenty of budget-priced delights and campy theatrics here. As far as t.v. knockoff’s go, this one’s a lot of fun. DVD Notes: This small-screen cult favorite just got its first proper revival on DVD via Scream Factory, who put it out on a double-bill disc with Are You In The House Alone? under the heading T.V. Terrors. This title is an MGM property and they supplied a crisp, colorful print that is leagues above the old VHS dupes that fans have had to make do with for years. Better yet, the retail price of this two-for-one special is a mere $15. Fans of t.v. movies and ’70s horror should make a point of snapping this disc up so Scream Factory will continue this series… there’s a lot of worthy t.v. horror titles out their deserving this kind of treatment and Schlockmania hopes they will do more releases in this vein.